Internet marketing services agency will exhibit for the ninth year in a row and join an expert panel on growth in the hosting industry. Vancouver, BC, June 11, 2014 – eBridge Marketing Solutions, an agency specializing in B2B internet marketing and SEO services, announces its participation at HostingCon 2014. eBridge President Hartland Ross will be joining a panel of experts around the topic of building versus buying a web hosting business as a growth strategy. eBridge will also be exhibiting at the trade show and offering free internet marketing services in a giveaway sponsored by email security services provider SpamExperts. HostingCon 2014 is being held in Miami, FL from June 16 – 18. The annual event, the only one of its kind in North America, brings together experts, industry leaders and exhibitors from the web hosting, cloud services and technology sectors. This marks eBridge’s ninth year participating at HostingCon. During the trade show Ross and Search Engine Strategist Frank Siano will be at booth 717, discussing the realities of internet marketing in 2014 and beyond for this highly competitive space. eBridge is also a sponsor for SpamExperts’ HostingCon sweepstakes offering $800 worth of internet marketing services as part of the prize, encompassing the Premium Service Provider Package plus a GoPRO Hero 3+ camera. Ross will also join an expert panel, delving into the topic of growth in the hosting industry, in the session entitled “Build or Buy? How to grow your small to mid-sized hosting business.” Other industry experts participating include Jamie Opalchuk, CEO of HostPapa Inc., Arvand Sabetian, Founder and CEO of Arvixe LLC and moderator Frank Stiff, President of Cheval Capital. The panelists will weigh in on the implications of adopting an organic growth strategy versus growing through mergers and acquisitions. The session will run Tuesday, June 17th from 10:00 – 10:45am. 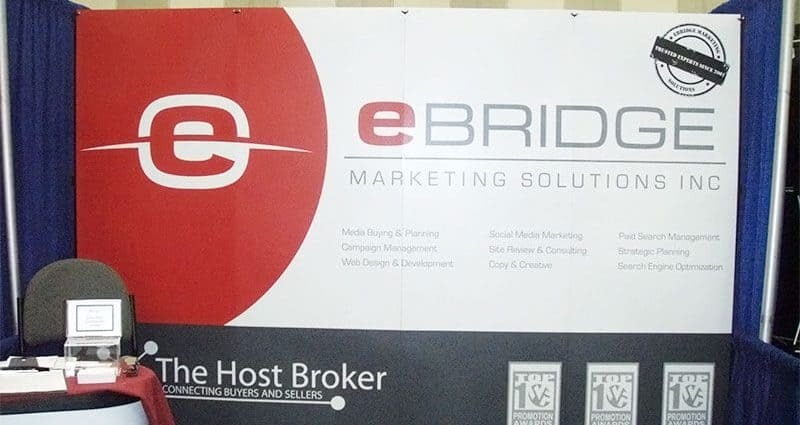 To find out more about eBridge Marketing Solutions, please visit ebridgemarketingsolutions.com or call 1-604-731-5530.